How to get to Bangkok’s airplane graveyard, how much it costs and what it is really like inside. Bangkok is known for a lot of exquisite sights – The Grand Palace, Wat Arun, Wat Pho, Vimanmek Mansion and countless others. The Thai capital also boasts a lot of intriguing and eye-opening places, such as Khao San Road, the Forensic Museum and Chatuchak Market. There is definitely no shortage of things to do in Bangkok, and most travellers find that a couple of days there is not enough. But one of the city’s most unique and fascinating attractions remains off many people’s radar – Bangkok’s airplane graveyard. Located in the busy Hua Mak neighbourhood in eastern Bangkok, the dilapidated shells of decommissioned aircraft are scattered across a vacant block on the edge of Ramkhamhaeng Road. Bangkok’s airplane graveyard consists of the wings, fuselages, and debris from jets that have been left in wrecks, including that of a McDonnell Douglas MD-82 and a Boeing 747. Looking out the back of the Boeing 747. Graffiti on the side of the Boeing 747 in Bangkok’s airplane graveyard. Having already visited the city two years prior, Alesha and I were on the hunt for some off-the-beaten-path experiences in Bangkok. When we first heard about this strange place we had already left the country, but promised ourselves that we would visit when we eventually returned. 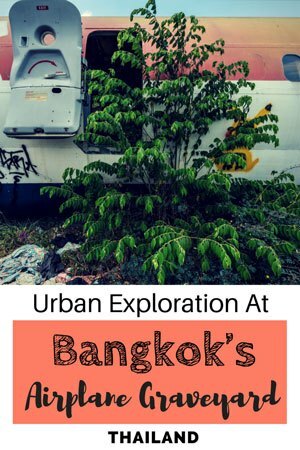 Now that we were back in Thailand, it was time to do some urban exploration. On a hot and humid morning (which is the norm in Bangkok in April), we left the Yim Huai Khwang Boutique Hostel and headed towards the canal to take a boat to the airplane graveyard. It took less than an hour, and soon enough we were standing outside the grounds. The wing section of the MD-82. Laying our eyes on these misplaced technological marvels in the heart of a city was quite a powerful experience. Completely out of place, yet somehow seamlessly complementing the rough and rundown urban landscape, the scattered and broken aircraft captured our attention for a few minutes before we made our way to the gate. An overweight yet cheerful lady was sitting on a plastic chair fanning herself in the heat. We asked if we could come inside, and she called out “200 Baht”. We nodded in agreeance, and she smiled as she got up off her chair. When she went to open the padlock to her wooden fence, she pointed at each of us, repeating “200 Baht”, indicating that was the cost per person. We happily agreed without trying to barter, and she opened the door and allowed us to roam around the property. An open door inside the 747. A young boy sitting next to the MD-82, left in disrepair in Bangkok’s airplane graveyard. There are three impoverished families that live on the premises, and no one is exactly sure how long they have been squatting at the airplane graveyard in Bangkok. They supposedly moved into the wrecks when they couldn’t find anywhere else to live, and make a living off of selling scrap metal and recyclable cans. When keen urban explorers first learned of these metal corpses and started asking permission to see inside, they started to charge money for entrance. While not legal, these families need the money far more than we do. And at less than $6 a per person, the value is still incredible. Exactly how the planes came to find themselves in this overgrown lot is a mystery to tourists, but locals say a wealthy Thai businessman owns them and has been selling parts over the years as scrap metal. Three family’s squat in and around the aircraft. Left to our own devices we immediately headed straight for the lumbering 747 that dominates the field. We crawled up through the luggage hold, being careful where to place our footing. Sharp edges and damaged parts are strewn throughout the fuselage, and you must maintain a level of focus as to not injure yourself. Minor danger aside, we moved deeper into the body. Both passenger levels can be accessed on the 747, as well as the cockpit. It was eery to be exploring the wrecked interior of one of the greatest inventions of the modern age. Eventually the heat inside the shell became too unbearable, and we climbed out to see the rest of the aircraft. The top level of the 747. Everywhere is open for exploration inside the 747, including the cockpit. Oxygen masks lay on the ground next to debris. We stepped and climbed all over the planes, with no areas being restricted besides the homes of the families at the far end of the lot. A young boy walked over to us and stuck his hand out, saying ‘money’ over and over again. We joked around with him, telling him no and trying to have a laugh. He soon got bored and started playing with the grass. The cockpit of the MD-82 still has two chairs, and we had some fun taking photos from the captain’s chairs. We saw two young kids wandering over, and we had a sneaky suspicion they were going to ask us to leave Bangkok’s airplane graveyard. Joking around in the MD-82 cockpit. Sure enough, the kids called out and told us that our time was up. In recent months the family has been kicking people out after one hour. Perhaps despite the extra income, they really don’t like people wandering through their claimed houses. Or perhaps they have started to become greedy. Either way, we asked the kids for five more minutes, and they asked for more money. We just smiled and quickly ran around taking the last of our photos. It took us another twenty minutes to get the final shots and see the last of the planes, and no one bothered us again. At this point we had seen all we wanted and were finished with our exploration. We headed back to the gate and thanked the family for allowing us to visit. They were sitting under the shade, fanning themselves and preparing food. They beamed smiles and waved enthusiastically as we shut the gate behind us. Heading back to the ferry dock and jumping a boat into the city gave us some time to think about just how unusual the last hour and a half had been. Exploring Bangkok’s airplane graveyard, climbing through wrecked fuselages and stepping over personal belongings of squatters had been a surreal experience. And while it may not have the esteemed status of the Grand Palace or Wat Arun, it is still one of the best and unique things to do in Bangkok. Never stuck my head outside of a 747 window before. A toy left inside the cabin of a smaller aircraft. There are three different ways to get to Bangkok’s airplane graveyard. Taxi – Grab a metered taxi and tell the driver “Ramkamahaeng Soi 103”. It is one of the busiest roads in Bangkok, so they should have no problem finding it. Cost varies depending where you hail the taxi from, but they are cheap compared to Western prices. Bus – Will be the cheapest option, and also the longest. Bus number 40 runs along Ramkhamhaeng Road. You can catch it from the Phrakanong BTS Station (exit 3), or from the Airport Link Ramkamhaeng Station. Klong Ferry – This is the way we took and in our opinion the best way to get to the airplane graveyard in Bangkok. – Jump on at a klong (canal) station that is headed towards Wat Sri Bunruang Pier. – You can find two easily accessible stations at Asok Pier (Phetchaburi MRT Station) and Hua Chang Bridge Pier (Ratchathewi BTS Station). – Get off at Wat Sri Bunruang Pier. This is the last station so you cannot miss it. – Walk through the temple grounds away from the canal and turn right onto Ramkhamhaeng Road. – Walk 200m or so, past 7/11 and over a canal bridge, and you will see the planes on your right. When we visited in April 2016 the families were charging 200 Baht (about US$5.70) per person. Even though this isn’t technically legal as they are squatters, do not barter with the families. They need the money a lot more than you do, and in our opinion for less than $6 this is incredible value to see one of the coolest spots in Bangkok! This is seriously the coolest thing ever! Super bummed because I was recently in Bangkok and missed this! Looks great, here in Costa Rica there is a restauran inside of a airplane located in Manuel Antonio. thai go there for free…. If you want to see real smile, nice people. Travel to a wonderful country, you should try Cambodia! Place like Siem Reap are simply stunning, people welcome foreigner with warmth. Thailand was great 2 decades ago, now its greed, corruption and crime, etc etc. A place best to avoid! We spent 2 months travelling Cambodia and yes it is a lovely place. We did go to Siem Reap, It was a beautiful place but unfortunately there are scams there like everywhere else in Asia. Buy a bag of rice for $50 and give it to the local people. Then they sell it back to the market and split the profit. Travellers just need to be aware of it and enjoy the country for what it is and not the greed and corruption of some locals in these countries. Pay squatters to illegally enter what is, I assume, private property because they “need” the money??? Nor is don’t barter, 200 baht is ludicrous, 300 is the minimum for a whole days work. 50 baht would be about right. They are greedy, but people are just dumb paying 200 baht. Been to BK at least 15 times in the last 5 year & never heard of it !! definetly going there next time. That was one of the best travel stories I have read lately, so different. Shall add it to the list when back in Bangkok! I think someone has missed a great opportunity to have them as basic accommodation for intrepid travellers and charge a few bob! Great post and thanks for the tip. Never heard of the airplane graveyard before but definitely want to visit when we’re back to Bangkok.